And we’re back. In the whirlwind of six days, we’ve managed to catch two massive bands in two different countries! Just like we predicted, they both were nothing short of amazing – Godspeed You! 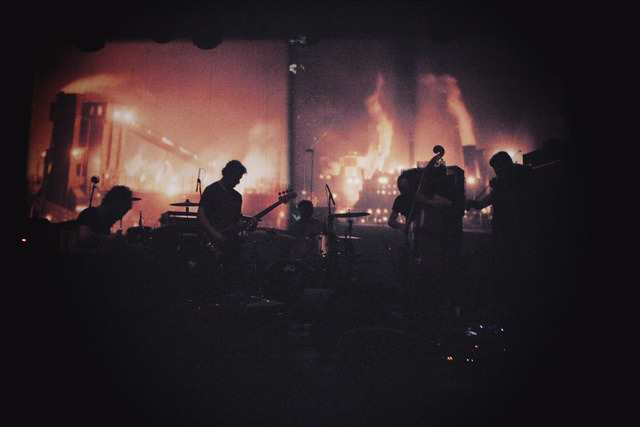 Black Emperor in the face-melting sense and toe being generous with their good vibes. Bit adventurous and a bit broke, we went through cheap hotels, merciless sun, frozen ATM cards, Google Maps (seriously, thanks – within a few days, we knew our districts like the back of our hands), long-winded train lines, rollercoaster-like monorail rides, street food, dozens of glasses of iced tea, paying homage to kings at movie theatres, hanging out with familiar faces but in a different city; it was quite the escapade, our first leg of the SEA Post-Rock Tour. 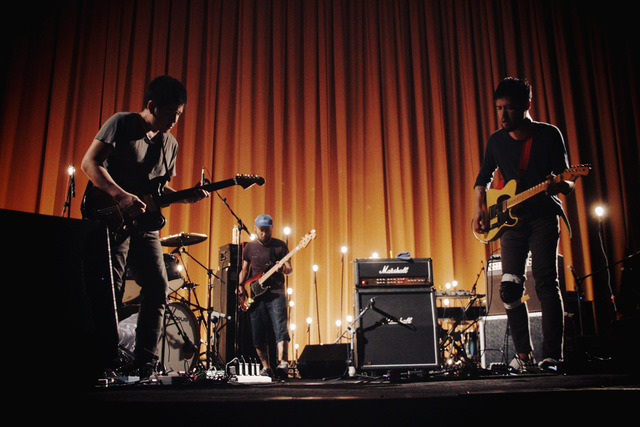 Like many people who came, it was our very first time watching Canadian post-rock behemoths Godspeed You! Black Emperor perform live, and without question an extremely good start to our Southeast Asian gig tour. As one of the most inaccessible bands ever to get into, those who can’t get around to appreciating their music would think ‘meh’ but for those of us who do get them... they’re something of a touchstone in our gig going disposition, something you’d strike off your bucket list. You can’t simply be a fan of Godspeed, you’re a disciple of their music. Our hopes of ever attending one of their shows were fading away when the octet went into hiatus after 2002’s Yanqui U.X.O and completely dashed when they officially broke up in 2008. But in 2010, they reformed and lo, they released one of the best albums of 2012, the ferocious ‘Allelujah! Don’t Bend! Ascend! So forgive us a little when we joypuked over the fact that Malaysian indie label Soundscape Records were bringing in Godspeed You! Black Emperor to KL in April 2013. Standing inside the venue of KL Live! in front of where the stage was set with hundreds of other like-minded devotees, you just can’t help but soak in the atmosphere. Which was pretty tense. It got even more nerve-racking when the house lights dimmed and the drones kicked in - drones that you would only hear in a Godspeed record and no where else. A long, foreboding din of noise, something you’d imagine how the seven trumpets of the apocalypse would sound like. Twenty minutes of hushed silence from the audience, all of whom undoubtedly wish they were nowhere but right there in Kuala Lumpur, about to watch, nay, experience one of the most legendary bands of all time. One by one the members filled up the stage in the darkness - no words exchanged neither with each other nor the audience - with the film projections flickering onto the massive screen behind them with an assertive scrawl that said HOPE, as it quivered in tandem with the buildup of aural elements that ferociously segued into “Mladic”. It was a taste of what to come - an aching brilliance of slow, fragile melodies that would snowball into breathtakingly colossal rocketfalls of sound and music. It’s a little unfair to call the songs they performed as 'songs' - they felt more like movements in a two hour long electric symphony. It was relentless tsunami wall of noise that consumed everything in its path, hitting you with all the softness of an iceberg. The sound they made together was spectacularly epic, a soundtrack of when galaxies collide. It was a tangible entity that everyone in the room could feel as it clutched onto our hearts and wrinkled our minds. Listening to their music and being bombarded with their striking visuals left me in certain state of extreme polarization; a simultaneous feeling of dread and euphoria, calm and anxiety, fear and rapture. The swirling wave of emotions dissipated naturally as it began, as each movement climaxed and ran its course. An essence of all and nothing at the same time. It felt less like a gig and more like a performance art show. On the second level behind us, the band’s projectionist was playing hundreds of film reels on four projector units that all screened simultaneously, a chaotic yet sensible jumble of visuals that depicted printed words, blueprints, landscapes, mugshots - general apocalyptic visuals. There was only the small shine of the projector to illuminate the band members, only to express that Godspeed You! 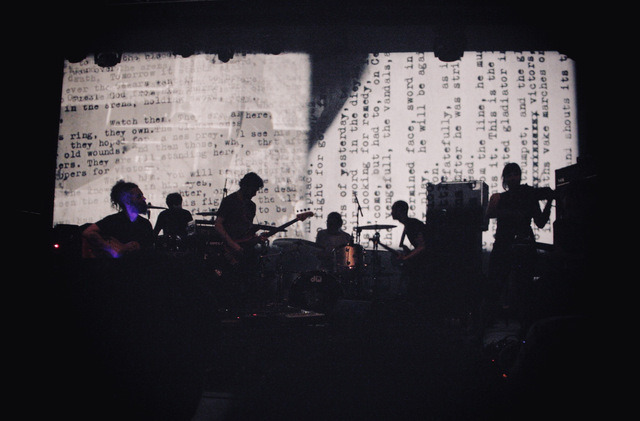 Black Emperor is not about the people behind them; it has and always will be about the music. I found myself closing my eyes just to slow down the volume of overwhelming emotions that were flooding into my senses as the 45-minute song “Behemoth” droned on. Here was live music that made you not think in words but in pictures. Looking at Sophie Trudeau playing her violin parts in "Moya" for example, created visions of war, sorrow and insanity in my mind. I think the whole experience broke my head a little midway. I lit my cigarette, fingers fumbling and trembling. The final movement turned out to be the most cinematic; projected visuals of oil rigs on fire as the band thundered on with "World Police" in the foreground, their music a fitting soundtrack to civilizations set alight. And when the show finally ended, it became clear that this was not a show per se. Each show is a tour de force by itself, an unearthly cathartic experience that only Godspeed You! Black Emperor, and only them, can execute. Held at the beautiful old-school (it even has it’s own large theatre marquee sign), art-deco theatre, the Scala is surprisingly welcoming and cosy, having exited the crazy weekend crowd on the main streets of Siam just a few metres outside the venue. But first. Get a tour t-shirt from the merchandise table, grab three Chang beers (when in Bangkok) for 100 baht, finish off some of them cheap cigarettes, and we were all set for toe. 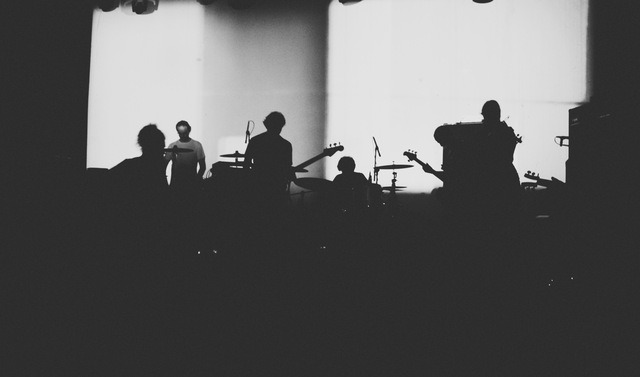 We got our first taste of Thai indie music with Bangkok’s Two Million Thanks, who are a little post-rock, at times more rock, a little grunge, and even a little American Football. Despite this interesting and heady concoction, our only regret is not understanding the language better to figure out the crowd banter and jokes, and especially the lyrics. Making a clean and understated entrance, the members of toe took their places onstage; a bare set up, surrounded by dozens of lighted bulbs on bare stands, it was minimalism with an element of ethereal. Like the countless amount of videos I'd seen of their live shows, they kept to the circle-formation; the only difference is that this is probably the only seated show they have played at. Perhaps it was the polite manners of the locals or silly uniformed men lurking in the shadows enforcing rules, the audience stayed seated throughout the set until Yamazaki Hirokazu (vocals+guitar) made everyone stand for the encore. For a moment there was confusion among the crowd, none for us though – we took our bags and secured premiere spots in front of the stage. When toe plays, there is no way you can sit still. With barely any words between songs, except for the occasional joke or self-depreciating comment, they pushed through all their songs, playing favourites like ‘Run For Word’, ‘Tremolo/Delay’ and of course, ‘Goodbye’. All the members in the zone, all the members busying themselves with their instruments but never once standing still, only breaking out from it to thank the crowd. And gracious they were when technical difficulties after playing in the early part of the set meant that for ten whole minutes, we would be deprived of musical goodness. 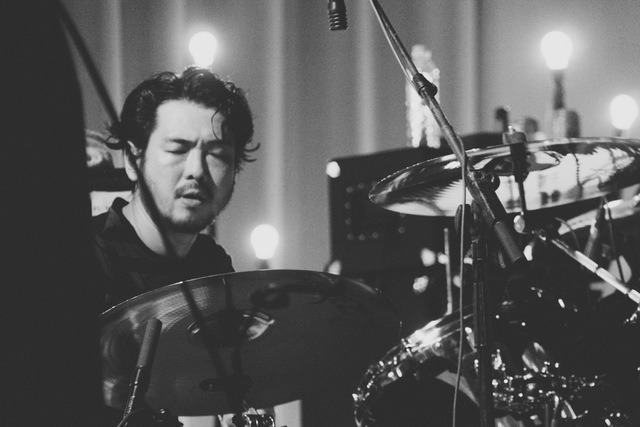 But let us have an entire paragraph for genius drummer, Kashikura Takashi. The entire time he was working that drum kit like it was only him and the drums in the room. Incredibly intense and vehement was his drumming that I was seriously impressed by how he managed eye contact with his band members and also maintain his state of trance at the same time. Playing with Japanese efficiency but with the burgeoning emotions of the Romantics and together with the heady mix of the three guitars, they were unleashing quite a sonic spectacle, the complex but rhythmic progressions, infectious riffs that make you sing along (yes, even without lyrics), it was like listening to them for the first time again. At the closing moments of the show, standing there in front (quite literally) of one of the best things to come out of Japan, I shared a smile with a dancing concert-goer who pointed at Yamazaki Hirozaki and mimicked fainting. That moment was my existential enlightenment for the entire trip; not being on home turf, not sharing a language, watching a Japanese band in Thailand and still, there are things that transcends the things that do not matter when it comes to enjoying good music.